On November 30th, American Banker named three Community Bankers of the Year. When I read about their selections, and reviewed their financial performance, I e-mailed Bonnie McGeer, Executive Editor at American Banker Magazine, to say that, in my opinion, they nailed it! Not that they need my endorsement. But they did notice when I sniped at one of their past Bankers of the Year awards. Banker of the Year typically goes to larger financial institutions. But I digress. 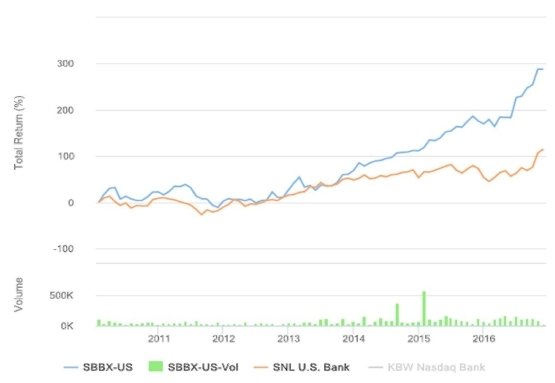 When I read about Banker of the Year and other such recognition, I will typically look at the financial performance of the bank to see if the award holds water. There are few things more regressive to me than for a banker to receive recognition without accomplishment. It cheapens the award, and diminishes our view of the truly accomplished. But this year was a bumper crop, I tell ya! Mark became CEO of GABC in January 1999. So he's been at it a long time. When he got the job, the bank was $637 million in total assets, had an Efficiency Ratio of 62.5%, an ROA of 0.96%, and an ROE of 9.1%. Today the bank has $3.0 billion in total assets, an Efficiency Ratio of 61.2%, and an ROA/ROE of 1.20%/10.7%, respectively. So the bank performed well in 1999, and Mark has improved on it. The bank is a consistent, German-engineered performer. As good as those numbers are, Mark's real home run was his total return to shareholders (see chart). From the day Mark assumed the reigns at GABC until today, the SNL Bank Index had a total return of 90%. GABC's was 424%. Credit: I got that "German engineered" quip from GABC's financial advisor. Kevin's story isn't punctuated by his bank's total return since he became CEO in March 2013, although it did mirror the index. An investor would have enjoyed a 74% total return in HOPE stock during Kevin's tenure, versus 77% for the SNL Bank Index (see chart). 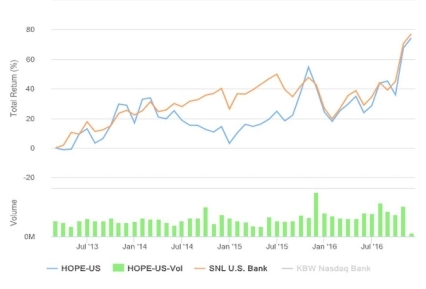 No, Kevin had an impact from the moment he joined the Board in 2009, first advocating for raising more capital, and negotiating the merger between Hope's predecessor, Center Bancorp and Nara Bancorp, another Korean-American focused bank. The deal closed in 2011, and BBCN was formed. After closing another deal for Wilshire Bancorp, a $4B bank, in the third quarter, Hope became what it is today. Financial performance is similar to when Kim assumed the reigns in March 2013. Then, the bank had an Efficiency Ratio/ROA/ROE of 45.5%/1.28%/9.13% respectively. Using this year's second quarter to avoid the Wilshire special charges, those numbers were 46.8%/1.20%/9.67%, respectively. 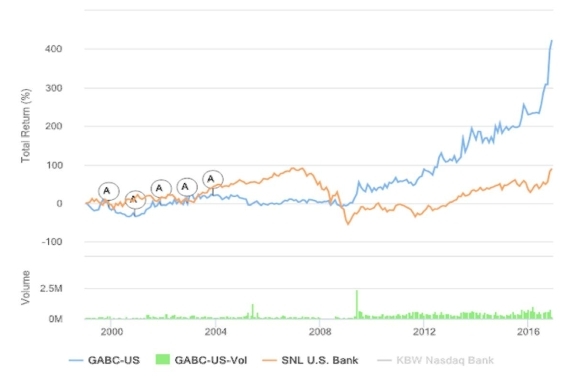 What impressed me most was the bank's turnaround since Kevin joined the board, the transactions he has negotiated to significantly grow the bank, and the 32% earnings per share increase since he took over. That's right, 32%. When Tony took the reigns at Sussex Bank in February 2010, non-current loans/loans was 5.48%. Today they are 0.75%. I should end this section right there. But I'll continue. 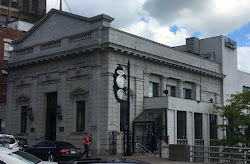 The bank had $452 million in total assets. Today it is nearly twice that size. Net income was approximately $1.2 million annualized. Today it's $5.6 million. Efficiency Ratio/ROA/ROE? Was 61%/0.21%/2.80%, respectively. Now: 68%/0.70%/7.79%. And the bank continues in a significant growth mode. And due to the bank's historically rural markets, he's #GeoJumping! See my firm's most recent podcast, minute 17:40, for a discussion on geo-jumping. I'm claiming the trademark. An investor earned a 288% total return since Tony took the reigns, versus 115% for the SNL Bank Index (see chart). I'm one happy investor. Disclosure: I'm personally invested in SBBX. And there are my reasons why I think American Banker NAILED IT! What other great banks are out there that didn't win the hardware?